... 1576, in France, was signed the Edict of Beaulieu. (Another site points to a presigning today, and signing of this precise document on May 7.) By this pact, France's King Henri III and his mother, Catherine de Médicis (right), ended the 5th of the country's civil wars, which pitted those leaders against Henri's brother, François, Catholics against Protestants. 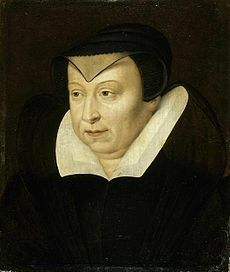 (portrait credit) According to this source, the peace, which granted some religious freedoms, was "forced upon" the Catholic king "by bankruptcy that denied him an army sufficient to meet the Huguenot army and German mercenaries" assembled against him.